The Man has taken all the kids out for the day. What in the world am I supposed to do all alone? This happens like once or twice a year for me. And I'm stumped when it does. Eat myself into a food coma. Take a 45 minute shower. Catch up on photo editing. Share my new designs with you. Guess what I decided to do? Blog and give away some free jewelry, of course! Let's give away 2 $25 gift certificates. 2. Leave another comment telling what you'd spend the money on from The Rusted Chain. I went to a crafty market today and don't really have any plans for tomorrow, I'll just relax, clean up a little and maybe visit 1 or 2 shops. I'd probably get the Live Out Loud necklace, because I love the message and the colors. Well, today was a slow day. I didn't sleep last night so slept this morning. Gonna do a little knitting this afternoon.The hubs is out today so I too am all alone. I have no idea what tomorrow will bring. SOmething together I hope. Maybe groccery shopping sometime. I'd have to have a 'faith gives me hope' necklace or a 'capture life' necklace. The two things I want sooo bad, although now with the new designs the bow is awful sweet! Going to my friends birthday party...at a cooking school! Yep...a fun menu, lots of girlfriends...and I am the "official photographer". Oh, and I will be crossing my fingers about winning! Volunteered this morning and plan on sewing this afternoon. It's been too long since I've done that. Sunday is church Nd maybe some more creative time! Yay! I love all the new pretties! This weekend - well I am taking the boys to a birthday party in about an hour and beyond that I don't know. The hubby is out of town too. Hopefully I can get some photo editing and some writing and blogging done. Thanks for doing a give away! I just got home from a week away and am enjoying just being home (well and getting the house back in order too!) Thanks for the chance!!! Today I am working EMS til later in the evening while the hubby is having a workday at the church and helping his dad with their deck and tomorrow we are celebrating my sons 1st birthday and ending the day with a co-ed softball game. Also - love the new initial necklace with the swirl. That's what I'd spend my money on if I won! Weekend plans: watching hubby paint the kitchen! and my choice for jewelry would probably be the three tab necklace and I would get the three kids names on it. I also love the Live Out Loud necklace and any of your religious ones....love them! this weekend includes a wedding and resting :0 love you stuff! 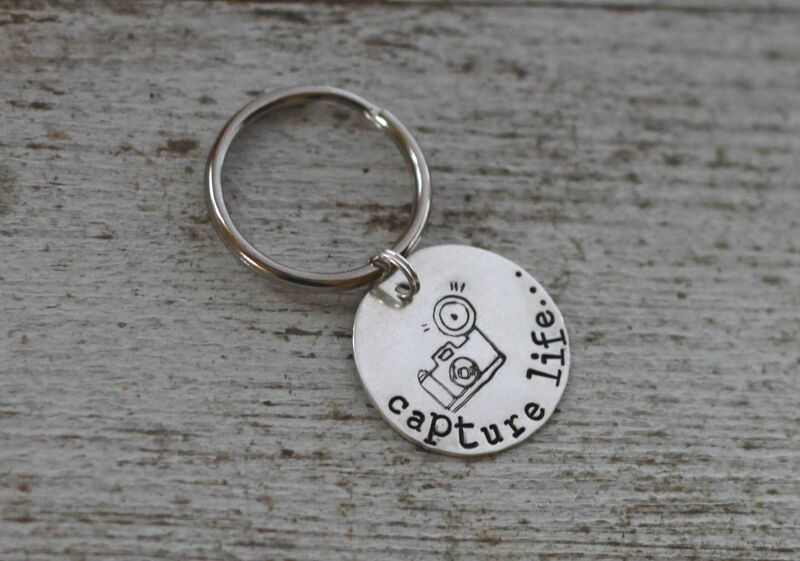 I would get the capture life keychain to match the capture life necklace I just got! I am watching football this weekend! Workday for Interfaith Ministries thru my church, wedding to go to @ 5:30, church tomorrow, BD party for 5-year-old grandson. Whew! Lost my bank card, so that's first on my weekend list...and a visit with the horse. I am hoping for a quiet weekend! Love the Swirled Monogram necklace! I would love to give it to my Daughter.. Lets see today I went to a birthday party then came home and did laundry...Tomorrow we will be going to a pumpkin patch! I cant wait it should be fun! I would totally spend a gift certificate on new sets of earrings for my and my best friend! We watched our boys' soccer & flag football games this morning & now we are just going to enjoy this beautiful weather!! There are SO many choices to spend the gift certificate on!!! I love the new capture life keycahin, but I have also been wanting a necklace with my kids' names on it. I have already been out to soccer tryouts for 2 of my sons this morning, this afternoon and evening will be spent doing some cleaning and hanging out around the house and then tomorrow we are off to lacrosse for my other son. I love the new swirled monogram necklace, I think I would get it. Weekend plans... catching up on all the stuff that I feel so behind at in life!! I would get the capture life necklace!!! I have been dying to get it!!! I have a bloggy friend who is getting ready to run her first 1/2 marathon. I would buy your new necklace for her!! I had to work today :(, tonight is family movie night, and tomorrow is a family fun run for Diabetes. I would so spend the money on those sweet new cranberry earrings! Today we went to go look at the the place my sister is getting married at next spring... and trying to imagine how we would decorate! If I won, I would start a grammie necklace as my first grand is due next month! I am LOVIN' your new designs. Our weekend plans include soccer pictures, movie day, church and a potluck! FUN FUN!! I would spend my money on a custom necklace for my anniversary w/the dangle pumpkin charm. My anniversary is Halloween. weekend plans: yard work before the rains set in, library story time, the park. I would spend the money on those great new Cranberry Spray earrings! I went to a craft show today and tomorrow will be laundry. Oh fun! the swirled monogram necklace would be lovely. such simple beauty. We're working on some household projects today...enjoy your time along! I would probably get the cherished necklace or soar. Hubby's gone for the weekend, so my job is to entertain the kids - UGH!!!! Hoping to check out a local mitocondrial fundraiser and then take the kids out to dinner. Or maybe even a little something for my daughter instead. I would buy the "I Have Decided" necklace. I absolutely LOVE it. Gorgeous! Also facebooked it! Tagged your name in the message. Have a good one! My weekend- today, watching college football. Tomorrow, a first birthday party. Somewhere in there I'd like to do a little shopping! Now... if I could pick just one item at the rusted chain, it would most definitely be the Est. necklace. I have loved this necklace for so long. It is definitely on my wishlist and I'm just holding out for a holiday so I can flat out ask for it! 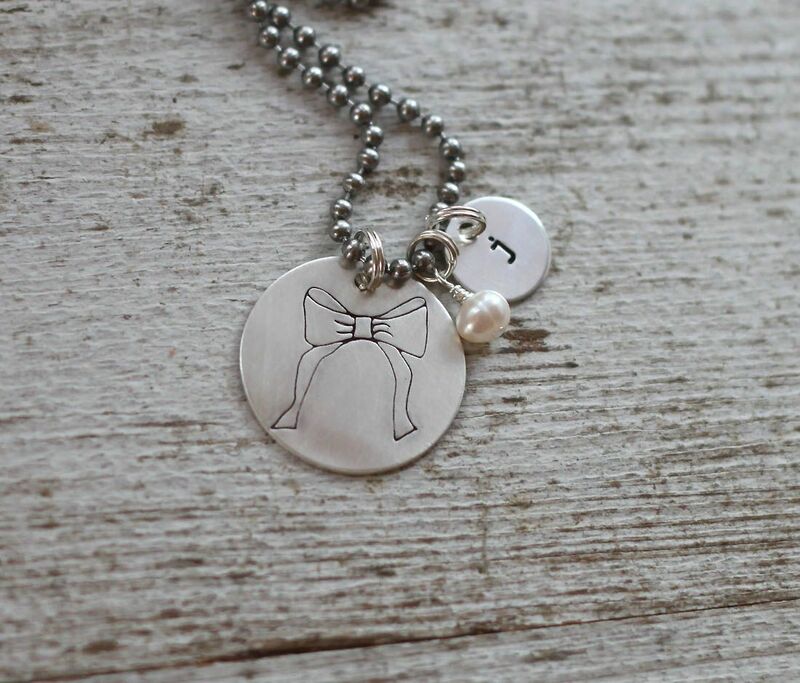 Next on my list is the family is forever necklace. Really love that, too! BY BIRTHDAY IS SUNDAY!!!! But I'm also getting some birthday gifts ready to give out/send out this week. Lots of September/October birthdays in my family. I would spend the $25 on one of your pretty necklaces... I can't really decide which one. But it would be a lovely birthday gift to myself. If I had $25 to spend at teh Rusted Chain, I would buy the Survivor necklace for my mom. Clean up the yard, and decorate for fall.... I love this time of year! Reading and being lazy. We were going to go to a hot air balloon fest , but the weather had other ideas. I would buy something special for my friend who is a long term missionary in Haiti. today i watched my boy play football, get a touchdown, lotsa yards, an interception and then get MVP of the game :) was sooooooo proud!!!! tomorrow he's at hockey, i hope it's as exciting!!! i think i'd like to get some earrings next, i love so many of them and i have 2 necklaces, so i'm thinking it's time to venture over to the other side, momentarily at least!!! If I won the giveaway I would pick the camera necklace and give it to my photographer sister for her birthday! It's absolutely adorable!!!! You should do ALL of the above but the exercise! i hear ya,thats just plain crazy talk! either way im in the same boat and hope whatever you do you enjoy every moment of it!! thanks for a chance to win! dance class for lola, tae kwan do class for kyan @ the same time and there is only one of me, as daddy is working! then off to a football game tomorrow (go cardinals), where we will tailgate prior with friends! ok take three on the comment thing! We have been fall cleaning all weekend! 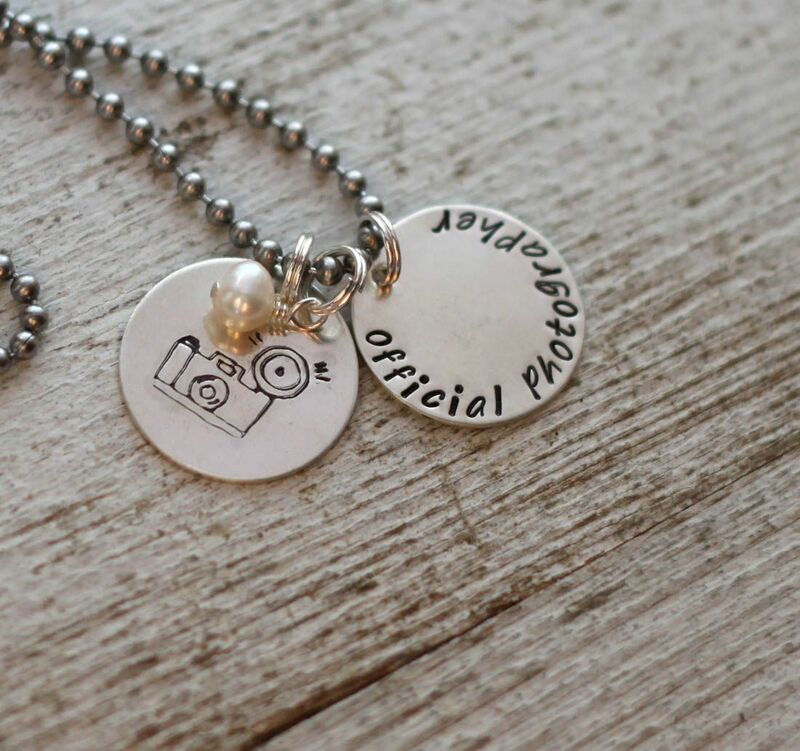 I love the official photographer necklace! I neeeeeeed one since I officially have a new photography business! i would have to say that i love the choose happiness necklace! Playing secretary of state in my own home. Not in my plans, just my reality. Plans were yard work, inside purging, getting ready for the cold weather to come. I started my weekend early yesterday, spending the day at the beach with my sweetheart & his family - it was lots of fun! Today is just a chill day, went shopping, been crocheting, reading, and now catching up on blogs! Weekend plans include celebrating BIL and nephew's birthdays and having a Scentsy party! Watching football, making waffles for dinner and looking forward to some cooler weather! getting my glee on and doin' the puyallup this weekend. i would probably get the capture this necklace charm. love it! My choice would be the GOD IS GOOD necklace. 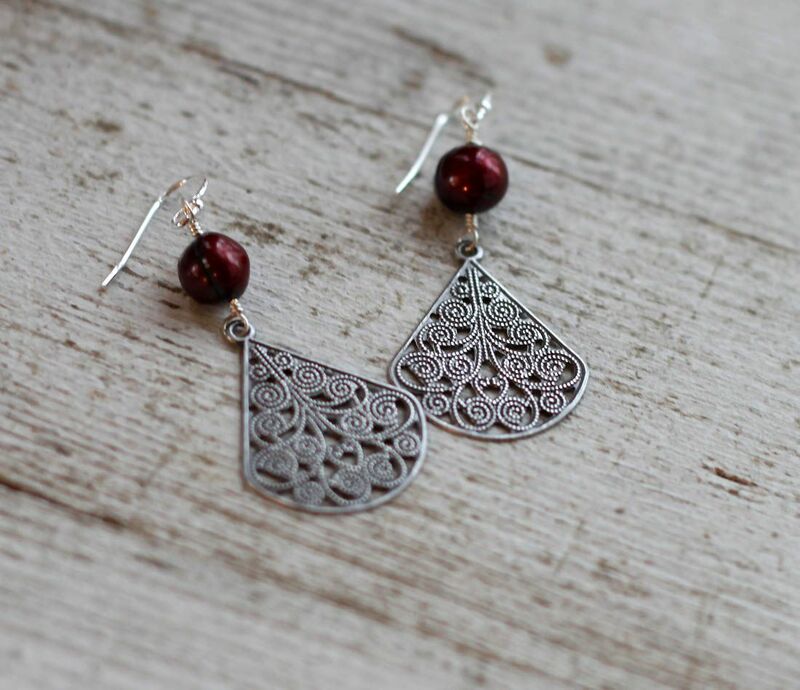 I do love the new cranberry earrings too. We have friends in town so we are showing them San Diego...tonight La Jolla!! I'm making chocolate glazed pumpkin cookies for a potluck tonight. Then coming home and being lazy! I've always wanted the "how great is our God" necklace. love that funky mama necklace!!!! This weekend I'm celebrating my niece's 5th birthday! Can't believe she is already 5! If I win I'm buying the "You Are My Sunshine" necklace! I sing that to my boy all the time! I also love the 'in christ alone' necklace ;)I love it all!!! Love your Amazing Grace necklace... gorgeous! I would buy the "I love you more" necklace - I've had my eye on it for a while! Tomorrow is church, then I've got some sewing to do and finish PTO newsletter (if not already done). Today we slept in after an emergent ambulance ride to the ER for my 3 yr old. He was not breathing well and scared the crap out of me. Quiet day. I went and got my nails done and wandered around Walmart alone(not sure what to do without the little ones). Tomorrow, we are going to a birthday party for this wonderful little girl in Max's class. Her mom came and got Max in the middle of the night so he did not have to go on our hospital adventure. I would get the live out loud or the I have enough necklaces. I have to remind myself of those things frequently. What a beautiful way to do that. Hubby's 10 year high school reunion and fun family time..oh and of course the Colts game! Have fun alone...the possibilities are endless! I went to a Tastefully Simple Party today and tomorrow I am going to relax on my deck with a good book, cup of coffee. Nothing special but still the best. Let's see... this weekend I am working! So, those are basically my only plans. The next weekend I am not working (the second weekend of October) we are going Apple Picking though! I can't wait!!! I would DEFINITELY get the Capture Life Necklace. I just LOVE it and that stamp... such a great design! Today we went shopping for a newer car (I fell in love with a minivan) and had dinner with my folks. Tomorrow we'll go to church, have another dinner with my folks, and take my oldest to Girl Scouts. If I won the gift certificate... I think I would consider buying two necklaces. One for each of my daughters, stamped with their baptism date. Tomorrow is church and clean out the garage day! I love all your work but my heart goes out the the cranberry spray earrings! I'm planning to finish painting our shutters! If I win, I think I would get the swirled monogram necklace! my week end plan is to go shopping with my visitor in from CA for the week end. I would spend my GC on the Swirled Monogram necklace. whoops! This one didn't get posted, guess I just previewed it. We are doing a whole lot of nothing this weekend, which is fine by me. My husband and I leave on Tuesday for our first long trip without our boys, so we are soaking in some quality family time! I just got home from shooting a wedding :) Lots of fun, great couple and wedding party and a huge tour bus for the day..
and Sunday we are heading off to Canada's wonderland with 2 super close friends of ours. No kids, just the adults on adult rides ...that's a themepark !! as that's just what i am!! love it. Unfortunately nothing too exciting this weekend. Attend my daughter's soccer game, prepare for company tomorrow and prepare my Sunday school lesson. I love the new items! Probably get the cranberry spray earrings and the swirled monogram necklace. 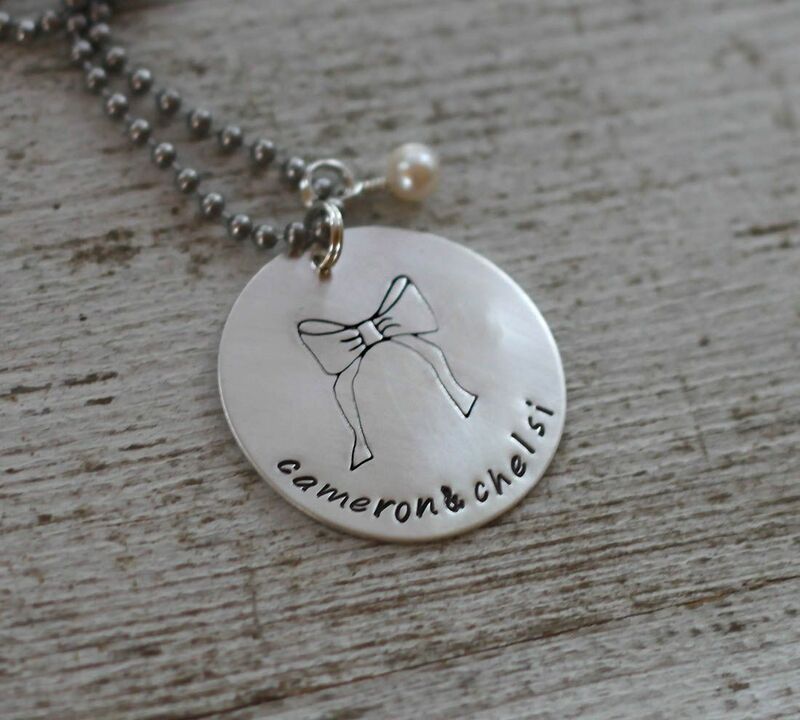 I would lave to have the 2 names necklace for my 2 babies! I am going to my parents' 55th anniversary party then working in my flower beds! So excited for cooler weather...Love, love, love!!! friday we drove 5 hours north & got to listen to the boys watch thomas the train almost the whole way (wished i had brought earplugs!). saturday i shot a wedding all day while my husby watched the kids. took a bath when i got home because i was so tired & sore. tomorrow we drive 5 hours back home. and i'm hiding thomas. i would definitely buy your bird necklace. soar. 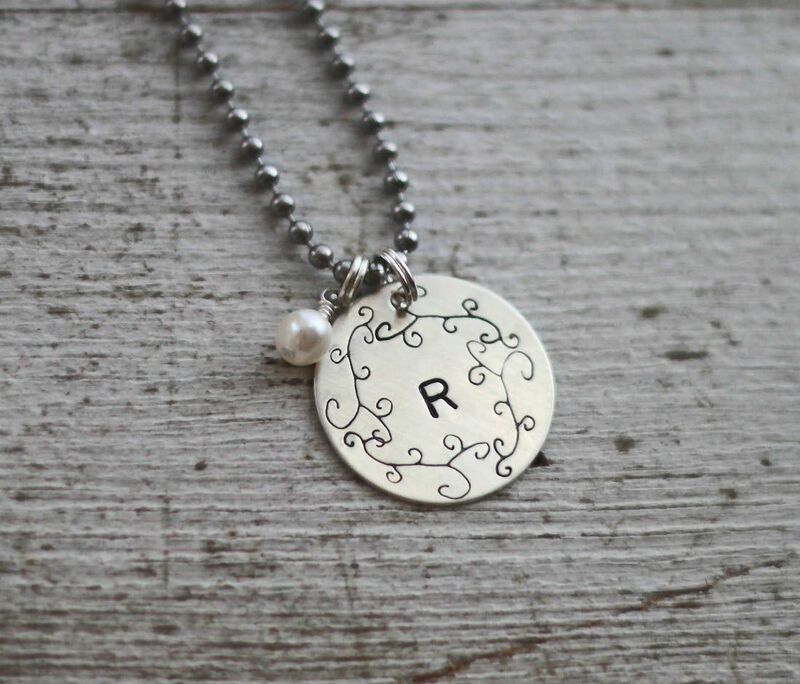 I love pearls, girly things and my daughters so I'd definately put the voucher towards a sweetly yours necklace with my girls initials x.
and i would spend the gift certificate on 'oh happy day' for sure!! I had some sweet friends throw me a girly baby shower for our little Sprig due in 4 weeks! Ate myself a piece of cake with homemade buttercream. Mmmhmmm. Today we're going to participate in a media church service and relax! I went to a ferret show yesterday with my two ferrets. We came home with two seventh place ribbons, a third place, a fifth place and a tenth places. Woot woot! Our weekend plans are the same as always while hubby is in school full time, relaxing with the kids! 2nd entry - I would either use the gc towards the swirly monogram or the bow necklace. Both are super cute! 1st entry - We had a date night to celebrate my husband's birthday last night and plan to have a picnic lunch after church today. We will celebrate my mom's birthday with family! Uploading photos to my new photoshop elements 9 program and organizing them. It's Sunday, and just read the blog. On Saturday, I went to my grandson's soccer game, visited my ailing father, and watched college football. On Sunday, I am going to church, and again going to visit my dad. Thanks for the giveaway Beki. Hope your weekend was great, also. My weekend plans included Disneyland yesterday, where my 2 year old rode the Matterhorn for the first time, and laundry today, whoo hoo! I love your designs, keep up the incredible work. I had saturday to myself too! I went to a few yard sales, Goodwill, got a pedi, roamed aimlessly through target.....i had a good day! i now HAVE TO HAVE the capture life keychain!!! Love, love, love it!!!! I went to a Gem and Bead show on Saturday and I'm spending time with my family today. My son and DIL came in yesterday and surprised us, so her and I are doing some beading with some of the supplies we got yesterday. I follow your blog. I would buy the 'plant seeds' necklace. That is adorable. And I love gardening, so it would be great to have. My weekend plans were to run a half marathon (this morning!) - which I did with my sweetheart crossing the finish line (and running the entire race) with me. 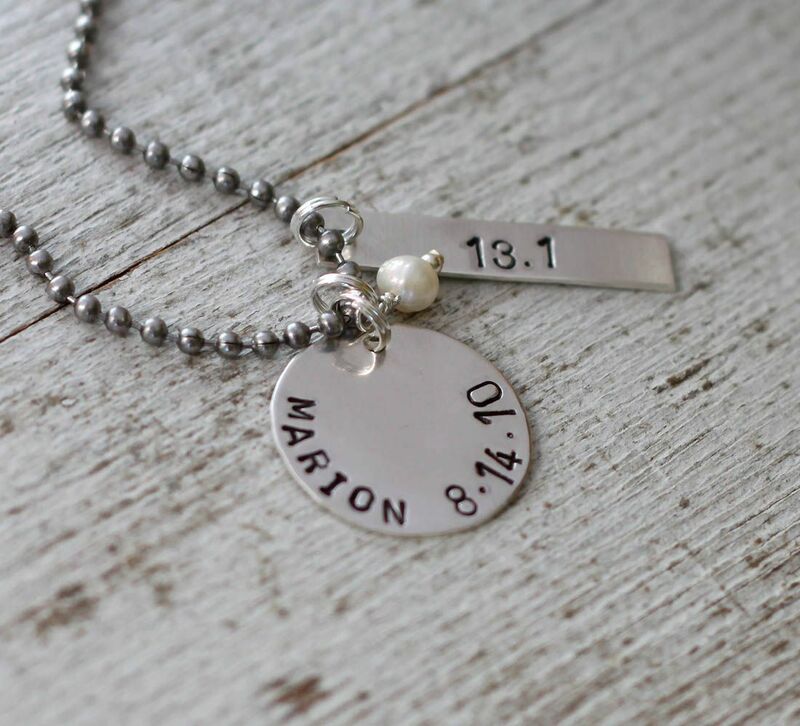 I would get one of those 1/2 marathon necklaces of course!! My plans for this weekend were to relax and catch up on grading. What I actually did was go to a fundraiser for my school, help with my cousin's superhero birthday party, and spend most of today getting a tire repaired after I got a flat on the way home from church.